• Can I “boost” my immune system? • Does caffeine make me live longer? • Do we still not know if cell phones cause cancer? • How much sleep do I actually need? • Is there any harm in taking a multivitamin? • Is life long enough? In considering these questions, Hamblin draws from his own medical training as well from hundreds of interviews with distinguished scientists and medical practitioners. He translates the (traditionally boring) textbook of human anatomy and physiology into accessible, engaging, socially contextualized, up-to-the-moment answers. They offer clarity, examine the limits of our certainty, and ultimately help readers worry less about things that don’t really matter. 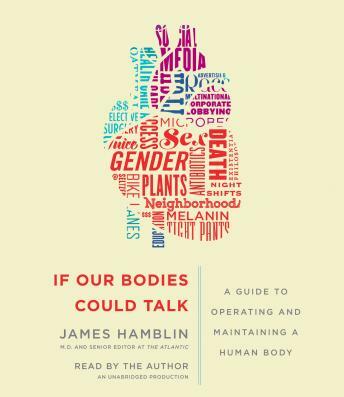 If Our Bodies Could Talk is a comprehensive, illustrated guide that entertains and educates in equal doses. Though I thought the book would cover different things about our bodies, I did find it stimulating, enjoyable and a funny read. When I say funny, the author takes very serious issues, explains them, and puts a funny spin on some of the explanations. If you want a good understanding of your body and a fun way to understand it, than read this book!